Size: 1.2m x 1.2m x 25,50,75, or 100mm thick. White or grey in colour. Lightweight melamine sound absorbing foam suitable for installation onto ceilings and upper walls. tiles with a smooth finish and Class 0 non-flammable. 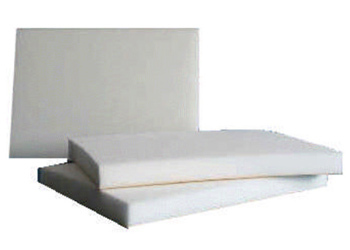 Melamine based acoustic foam is a unique, flexible, open cell foam, possessing a combination of low weight, a Class 0 fire specification with good sound absorption properties. Produced from melamine resins, Melamine foam exhibits superior fire, temperature and chemical resistance. Furthermore being halide free, Melamine foam when exposed to either naked flame or extreme heat does not emit any of the toxic bi-products associated with conventional polyurethane based acoustic foams. Melamines low density and flexibility provide a practical material, convenient to handle, easy to cut and install, either to original equipment or on-site projects. This outstanding versatility, coupled with choice of complimentary acoustic materials, e.g. damping sheets, barriers and facings, allows Melamine foam to be used in a wide range of industrial and commercial applications where superior reverberation control is required.Please Note: Although a superb acoustic foam this material does tend to expand and contract due to temperature and humidity so allowances should be made if fitting to an exact space.